This week’s episode was really good, but I’m not going to do my normal recap instead I’m going to address an important plot point that I feel like the show isn’t fully explaining, but are expecting you to pick up on. In the first episode they find a litter of direwolf puppies, one for each Stark child, and they were told to raise them and train them themselves. It was made very clear that these were dangerous animals, but it also became evident that the Starks (and Jon Snow) had an unusual amount of control over these animals. It is because they are all wargs. To an extent at least. Why is this important? Well keep reading– not only does this influence the whole Stark storyline it also is the key to Daenary’s problems. The books make it very clear that Jon Snow is a warg and a powerful one. The show does touch on this and explain that not only is he a warg, but so are some of the Wildlings. He begins to learn how to control his gift and how to control other animals besides Ghost. For Jon this doesn’t appear to be something that he has to work with at all with Ghost, but he doesn’t seem to have the same bond with any other animal. That is until he inherits Mormont’s raven. His raven is a larger than normal raven and can speak in eerily appropriate ways. The raven seems to be strongly connected to Jon and even before Mormont was murdered he seemed to care about Jon’s welfare. Why is this important for Jon? Possibly Jon had warged into Ghost while he was dead making his resurrection possible, but my biggest theory is that (especially now that the dragons are freed) he will be able to become a dragonrider by reaching into the dragon’s mind to be able to control it. Robb was also very attached to his wolf and it wasn’t until he separated himself from Grey Wind (because his new bride distrusted the wolf and her family was afraid of him) that he became vulnerable. Robb was not with Grey Wind when he was killed, but they made a show of killing the wolf too and then sewing the head of the wolf to Robb’s corpse. Why was this important for Robb? If he’d known how important and powerful this connection was he could have used it to stay in power and vet his potential enemies. He should have listened to his mother and kept his wolf close. Welp. Lady died pretty early on and Sansa admitted to feeling lost after Lady’s death. Sansa is horrible, self absorbed and really the worst character of the series (yes I say she’s even worse than Cersei or Ramsey Snow– she should have known better than to behave as she did). The show has made her a lot more sympathetic a character than the books so feel free to disagree with me. I get where you’re coming from, but she never asked or thought about Arya in the books and was only concerned with what was happening to her. Why is this important for Sansa? I’d like to hope that she wouldn’t have been a self centered b*tch if Lady had lived. At least she would have hopefully been stronger. Aside from Jon and Bran Arya is the next strongest warg in the Stark family. Jon learned from others that he could control other animals, but Arya finds out on her own that she can see through other’s eyes. This is my most recent issue with the show. In the books before Arya gets her eyesight back she warged into a cat to see who was attacking her and from where. I’m really disappointed they have left this out. Also left out is her wolf dreams. Ever since she sent Nymeria away she has dreamed at night of her pack and of hunting with them. In fact she was the one that decided to pull her mother’s dead body out of the river (but seeing as they’ve left Lady Stoneheart out of this. . . ). Why is this important for Arya? 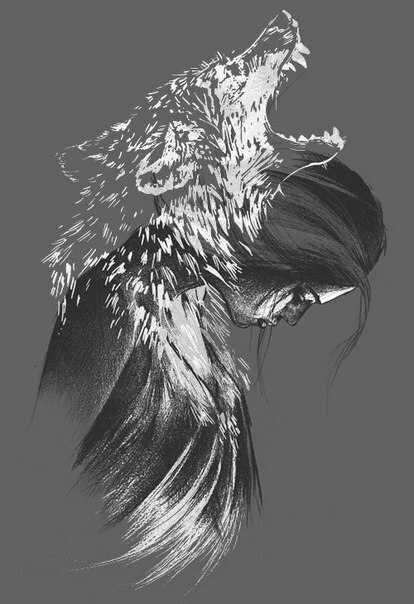 During all of her trials and tribulations her wolf dreams have kept her anchored and given her a family when she had none. Also her warging into the cat gave her encouragement and the confidence she needed to continue her training without losing her identity as Arya Stark (even though that’s what they wanted to happen). 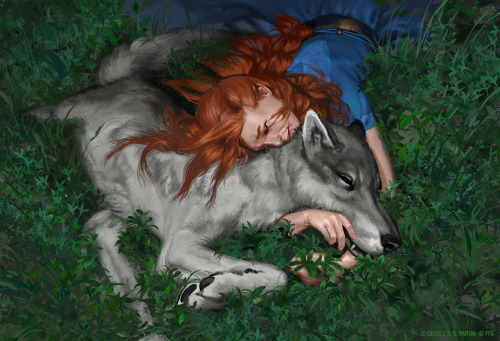 Her continued connection with Nymeria will also give her a ready made strong group of soldiers (even if they are four legged) whenever she gets back across the sea. She could even be a dragonrider– although I don’t see it going that way. I think perhaps you have to be a warg AND have Targaryen blood to be a dragonrider. This is the only Stark that the show has repeatedly shown as a warg. His abilities have allowed him to control Summer, Hodor, and travel through the weirwood to see the past. Kudos to the show for showing this, but it just makes me even more frustrated that they’ve left all this out for the other characters. Why this is important for Bran? Well his powers have led him to the three eyed crow (with Meera, Jojen and Hodor’s help) and I think they will show Bran all about R+L=J (hopefully soon– holy CRAP what a tease this week). He’s also poised to spill the beans on Jon’s parentage which could rock Westeros and it appears that he’s trying to communicate with the people of the past. I just hope he doesn’t screw up the present even more because of this. There is also something fishy about Old Nan talking about how all Brandon Starks are all the same. 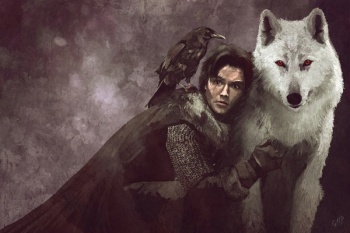 It’s stated that Rickon has possibly the strongest warg connection out of any of the Starks with Shaggydog (I really really hope that the Umbers are setting up a trap for the Boltons and that they really didn’t kill Shaggydog and haven’t really given up Rickon. The Umbers were very loyal to Robb Stark and it’s hinted at that they might be playing the Bolton’s false). He also appears to have some type of greenseer ability. He dreamed about the deaths of Ned and the rest and knew that they weren’t coming back long before anyone else did. Why is this important for Rickon? Ummmm because warging is cool? Also to help control Shaggydog. Not a lot is known about Rickon and I hope that we finally find out more about him and where his story will take the narrative. Yep not believing that Shaggydog is dead or that they Umbers are bad.. .yet. She dreamed of her dragons even before they were born and could feel their presence in the eggs. Then once they were born she was about to train them relatively easily. (Similarly to the Starks and their wolves). She’s had visions of Drogon flying over the land when she was sleepy or her mind was wandering. My thought is that she needs to warg into the dragon to truly be able to control him. 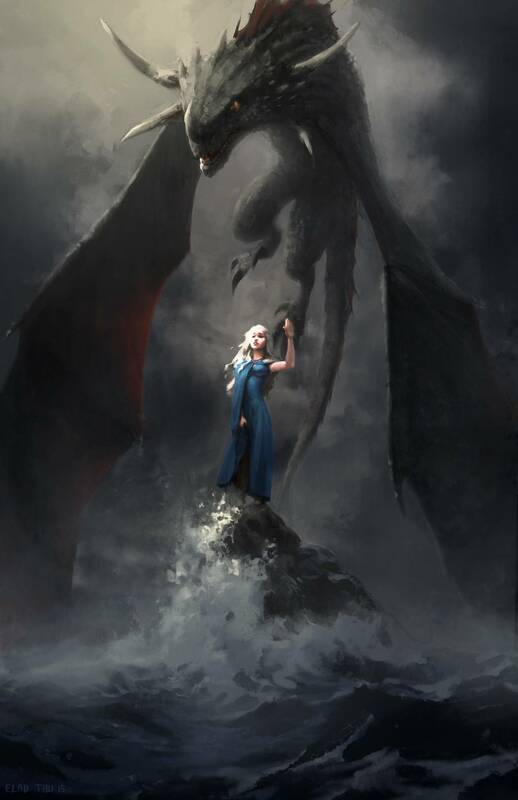 The times that she has had control are when she was very scared or emotional which just reinforces my theory that she has the ability to control Drogon, but she just doesn’t know how to access that power (but does so by instinct when under stress). Maester Aemon was very concerned about getting to Dany before he died as soon as he learned that she had three dragons. He said that he had important things to tell her and show her. I wonder if he wasn’t going to show her how to control her dragons and if perhaps he was controlling his ravens in a similar manner. For a blind man he sure saw a lot which would make a lot of sense if he was using his ravens to see for him. There’s always a chance that the show will tie up all these plot lines without introducing the ability to warg, but I don’t really see how. My biggest fear is that they will just throw it in and assuming you caught all the times that warging was alluded to. Like how they brought back Rickon and the Umbers with very little prep.